In the summer of 1984, I put together my first bus trip. I had never done this before but it seemed to come easy to me. The trip was a 3 day Washington, D.C. tour and I arranged everything down to the last detail. The trip was a huge success, which launched me on to a new career. That was many years ago. 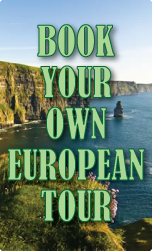 I have since moved on to owning my own travel agency with an emphasis on group tours. If you are going to write up an itinerary for one person, why not have 40 more people along for the ride? We are now a motorcoach tour company which specializes in museum tours, Broadway shows, art exhibits and many other delectable destinations. We specialize in group travel with a little twist. Included in all our wonderful tours to historic homes, Broadway shows, sports events and Meeting/ Convention services, we add a delicious breakfast, lunch or dinner aboard our motor coaches. We also serve wine, cheeses and soft drinks and any special desserts that accompany the theme of the excursion. We will spoil you with impeccable service, gourmet meals and the most exciting trips imaginable. We provide personalized tour guide service, private tours, with lots of special touches. We offer regional daytrips in New England, Meeting and Convention services, with tours from and in Providence, Newport, Boston and New York City and anywhere in between. We have a special section for Seniors that will allow them a day out and be back in the early evening. International travelers will love the convenience of one phone call or email to take care of all their travel arrangements to the Eastern United States. Whether it be at JFK, Boston’s Logan Airport, or Providence, Rhode Island, the most convenient airport of them all, we can be there to welcome you to the United States. For group travel, we design itineraries for group leaders all over the United States. We also have a section for groups that are looking for other passengers to fill up their trips. We have itinerary ideas, tour guide service and a section on how to become a group leader. "You are going to be pampered" is our motto. Sit back and enjoy the day.